"I do not want you to like me." Johnny Depp is such a supernova of a talent that we're willing to follow him just about anywhere, and his deliberate choice not to pursue down-the-middle Hollywood leading man roles makes his projects that much more interesting. It's not difficult to see what would have drawn him to a piece of material like The Libertine, but it's a project so enamored with itself and so enchanted by its own daring that it actually seems a bit silly. True enough, it rescues the dark side of seventeenth-century England from the whitewash job of high school textbooks, but cinematically it wants so desperately to be provocative that it ends up being a little tiresome, the prankster who fancies himself dangerous, but whom everyone else finds a bit annoying and much too loud. Depp plays John Wilmot, second Earl of Rochester, a man of great appetites: for alcohol especially, for women, and for the theater. He's an intimate of King Charles II�Charles' father was unceremoniously overthrown and executed; the dynasty was re-established, though the current monarch knows that this restoration is an uneasy one, and that he can't simply bully Parliament just because it's good to be the king. In the daring and dangerous Rochester, Charles looks for a propagandist, hoping that Rochester will produce a literary and theatrical spectacle to engender obeisance to the throne; Rochester responds with an astonishing and pornographic act of sustained spite, delivering up a production that's even more disparaging of the king than it is sexually explicit. But all of that is just sort of a sideshow to Rochester's real interests, which are whoring around and getting drunk, as frequently and loudly as possible, even though social convention has rewarded him with a long-suffering wife. She's heartbroken by his love letters when he's away, and his neglect when he's nearby; he's sure to be found with his drinking buddies, one more lecherous and besotted than the next. Rochester becomes absolutely enchanted with Elizabeth Barry, a new actress on the London stage�the rabble don't take to her technique and pelt her with fruit, but the Earl takes her on as a pupil, and the film portrays him as a sort of proto-Stanislavski, schooling her in Method acting and turning her into the toast of the West End. Their collaboration is on her Ophelia, and from this movie alone, you might imagine that no one else actually appears in the same play�these were the earliest days of women on the stage, though, so there's the suggestion that if they don't pull it off, conventions would revert back to boys in drag playing all the female roles. But ultimately, this is a movie that just kind of likes to wallow in it. Rochester's exploits as a sort of forerunner of the Marquis de Sade seem to have been as much about shock value as about the pursuit of pleasure, and this film fancies itself rather saucy; but you need not be offended by its vulgarity to find it a little bit boring, especially toward the end of its two-hour running time. You may wonder if Depp is squandering some of his talent on such a trifle; still, he's very good, and frequently mesmerizing. John Malkovich is fantastically campy as King Charles�his accent wanders back and forth across the Atlantic, but he seems so very merry in his great mop of a wig and his prosthetic nose. Rosamund Pike is compelling as Depp's suffering wife, and Samantha Morton, as Rochester's thespian prot�g�, gives a deeply felt performance, maybe the most human turn in the picture. It's hard to imagine really loving this movie, but for a while, anyway, it can be fun to watch its dirty little romp, you cheeky bugger. Image Transfer Review: Director Laurence Dunmore frequently favors handheld and Steadicam shots, and they consistently induce nausea. The transfer seems to have given the whole film a gauzy glow, and the color levels are sometimes muddied. Audio Transfer Review: The rabble in the crowd scenes are confined to the rear channels of the 5.1 mix, which is sonorous at the lower end of its range, but tinnier up top. Extras Review: Director Laurence Dunmore talks us through the project's history on his commentary �much of it is simply a celebration of Johnny Depp, and he provides a fair amount of plot narration as well, making this a track best listened to in bits and starts. A package (15m:05s) of eight deleted scenes doesn't include anything revelatory; in fact, the most interesting thing about them here may be Dunmore's commentary, which continues over these as well, in which he discusses the editing process, and why some bits here that he cared for simply had to be sacrificed for the good of the whole. 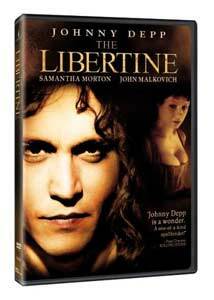 Capturing The Libertine (36m:05s) is a reasonably in-depth making-of piece, featuring footage from the set and interviews with Dunmore, Depp, Malkovich, Morton, writer Stephen Jeffreys, and other members of the production team. Especially interesting is the path the project took in development�it started as a play, produced in London at the Royal Court, and then Malkovich played the lead role at Steppenwolf, in Chicago, though he decided that Depp would be better suited than he to the role in the film version. But most of what's here is a lovefest, and there are the all-too-typical tales of a film produced outside the studio system and the difficulties in cobbling together financing. At times this is an exhaustive catalog of euphemisms for body parts and sexual practices; at others, it will make you deeply grateful for modern miracles like indoor plumbing and shampoo. It isn't dramatically all that compelling, but Johnny Depp is frequently enchanting, and the camp factor alone may make it worth checking out.